It is increasingly evident amongst practitioners and academics alike that the management approaches of the past have failed to deal adequately with the challenges posed by complex and rapidly changing systems. Indeed the call for integrated approaches such as those embodied in integrated water resource management (IWRM) reflects such concerns. This is because these systems are characterised by complexity in which an understanding of linkages, multiple drivers and unpredictable outcomes is critical. It is also widely recognised that the management of such systems requires an iterative, 'learning-by-doing' approach that is reflexive in nature and builds learning into the next management cycle. We suggest that any attempt to define and implement viable and effective governance of water resources, as well as rehabilitation measures, requires understanding that catchments are complex systems showing the aforementioned characteristics. As a corollary, an adaptive management approach appears best suited to such conditions. In this paper we argue that South Africa's highly-acclaimed National Water Act and associated policy documents such as the National Water Resource Strategy is an example of a policy document that reflects this thinking, as is evident in the guidelines for the development of catchment management strategies which are introduced and described. These offer a framework for the development of a holistic, systems understanding which is strategic and adaptive. In particular, under such a framework, we select the two cornerstones of the Act  sustainability and equity  to explore this theme. We show that under such a framework ensuring that both these principles are achieved is not through one simplistic management action but through an integrated, systems approach. The development of strategies is driven by principles which help one to navigate issues that emerge in complex systems in a flexible way. Visioning and scenarios offer important management tools for establishing a hierarchy of actions that can achieve the overarching principles and that can accommodating change. In complex systems, the users must be part of deriving management solutions since this is where and how they learn. Self-organisation, identity and embeddedness are all essential characteristics of building resilience in a catchment system. South Africa's highly-acclaimed National Water Act (Act 36 of 1998) provides the foundation for a new and fundamentally different way of managing the nation's water resources. Together with the White Paper for National Water Policy (which sets out 28 principles; DWAF 1997), it challenges the policies and values of the past by framing water resource management within the context of two fundamental principles: equity and sustainability (RSA 1998). These principles are strongly transformatory in nature, seeking to move towards integration, redistribution and equity in allocation, sustainable use, resource protection and participation (see preamble). Moreover, the importance of international needs is also recognised. Equally ground-breaking in nature, the Water Services Act (Act 108 of 1997) which provides for the rights to basic water supply and sanitation, recognises that although the provision of water and sanitation services is an activity distinct from the overall management of water resources, it 'must be undertaken in a manner consistent with the broader goals of water resource management'. These are provided for by the National Water Act. Central to the re-orientation embodied in the National Water Act (henceforth referred to as the Act) is the concept of integrated water resource management (IWRM). In this regard, the Act explicitly recognises 'the need for the integrated management of all aspects of water resources'. The Department of Water Affairs & Forestry (DWAF 2003a) defines IWRM as 'a philosophy, a process and a management strategy to achieve sustainable use of resources by all stakeholders at catchment, regional, national and international levels, while maintaining the characteristics and integrity of water resources at the catchment scale within agreed limits' (see also GWP 2002, Jones et al. 2006). In its entirety IWRM therefore aims to strike a balance between the use of resources for livelihoods and its protection for future generations, whilst promoting social equity, environmental sustainability and economic efficiency (DWAF, 2004 a). It also draws on a rights discourse (see Box 1). Another fundamental change that accompanied the policy overhaul was the management of water resources on a catchment basis. Indeed the Act notes that the National Water resource Strategy (NWRS) must provide the framework within which water will be managed at regional or catchment level, in defined water management areas. It also directs the Strategy to 'promote the management of catchments within a water management area in a holistic and integrated manner'. At about the same time that the Act was being developed, there was an increasing recognition amongst practitioners and academics alike that the natural resource management approaches of the past were failing to deal adequately with the challenges posed by complex and rapidly changing systems (see for example Gunderson et al., 1995; Holling, 2000; Kinzig et al., 2000; Holling, 2001; Folke et al., 2002; Holling et al., 2002). Indeed the call for integrated approaches such as those embodied in IWRM reflects such concerns (see for example Munro, 1995; McKay, 1996; Görgens et al., 1998; Global Water Partnership 2002; Penning de Vries et al., 2002; King and Brown, 2006). In this paper we seek to illustrate how the Act, together with the National Water Resource Strategy and the more detailed catchment management strategies provide an enabling policy mileu for managing catchments as complex, linked systems. This is evident in the newly-published guidelines for the development of catchment management strategies which are introduced and described in this paper (DWAF, 2007 a). These offer a framework for the development of a holistic, systems understanding which is both strategic and adaptive. In particular we select the two cornerstones of the Act  sustainability and equity  to explore this theme. We hope to demonstrate that, under such a framework, ensuring that both these principles are achieved requires an integrated, systems approach. We start with a brief overview of the emerging discourse on complexity and the implications that this has for management of water resources on a catchment basis. We then go on to introduce the catchment management strategies and to demonstrate how integration, reflection and learning are essential elements for achieving these principles. We suggest that both the water resource statutes and policies provide an enabling environment for strategic, integrated water resource management in complex systems. This intent is to be captured by the catchment management strategies  or CMSs to be developed by each of the water management areas in South Africa. In support of this, the Department of Water Affairs & Forestry (DWAF) has recently published guidelines for the development of these catchment management strategies (DWAF, 2007 a). Nonetheless, prior to describing these, it is opportune to examine the concept of complexity and why it is important for IWRM. The following overview cannot purport to provide an extensive review for those interested in complexity and systems theory and readers are referred to the cited literature. Much of this thinking emanates from a programme designed to examine complexity and resilience within the context of water resources in the Sand River Catchment. Catchments comprise linked social and ecological systems. It is widely recognised that each of these systems is complex in their own right, and it can be appreciated that additional complexity is added once their interactions are considered. Within the context of water resource management in South Africa, the concept of complexity is not a new one. Indeed, South Africa's policies and statutes make specific reference to complexity and, as a corollary, to the need for integration. The White Paper (DWAF, 1997) recognises the complexity of various socio-economic and ecological interactions in its calls for integrated approaches to water management. Moreover although DWAF has no direct jurisdiction over land use management, Principle 18 notes that 'since many land uses have a significant impact upon the water cycle, the regulation of land use shall, where appropriate, be used as an instrument to manage water resources within the broader integrated framework of land use management.' The NWRS dedicates a significant portion of the first chapter to the need for IWRM in complex systems. Indeed it explicitly states that 'freshwater is a complex ecological system that has a number of dimensions'. These include the inter-linkages between various components and the need to manage these links and relationships, such as those between surface water and groundwater; quantity and quality; runoff from the land, infiltration and evaporation; demand, supply and discharge, and land-use/water linkages. The linkages between sustainability and the ability to ensure basic water supply is clearly recognised in the Water Services Act (S11). These linkages operate across different scales both in space and time. Taking an even broader view, water has not only an ecological face but also socio-economic, political and institutional facets that need to be managed. In South Africa particular emphasis must be placed a full understanding of its importance for social and economic development. Colloquially, 'complexity' has a loose meaning, differing somewhat from the more conceptual meaning explained below. Complexity theory arose as a critique of linear causality and reductionist science (see Von Bertalanffy, 1972; Cilliers, 1998; Levin, 1999). Many managers and scholars alike have noted that outcomes (such as reduced flows or inadequate water supply) cannot be attributed to a single factor alone but rather represent a complex interaction of socio-economic, ecological and political factors. At the heart of this critique was the concern that such linear thinking had - and continues to - influence management and governance. In challenging this, scholars point out that sustainability remains an elusive vision and that linear, conventional thinking has not only failed to chart a sustainable path but has, in many cases, actually contributed to the problem (Holling and Meffe, 1996; Walker and Salt, 2006). It has been pointed out that natural and social systems are complex in their own right and that additional complexity is added by their interactions. A number of authors note that this poses particular challenges for disciplinary approaches (the so-called 'silo' approach) which may appear to work at first but are soon undermined by other factors that have received inadequate attention (see Berkes et al., 2003). Indeed, some assert that they cannot be understood, let alone managed, through conventional disciplinary approaches (Jasanoff et al., 1997; cited in Berkes et al., 2003). This is because the phenomena that we experience, or see, are reflections of multiple, diverse and distributed (scalar) causes. These attributes essentially describe complex systems, hence leading us to the assertion that complex systems thinking must underscore water resource management. Although a detailed review is beyond the scope of this paper, it can be noted that a complex system can be distinguished from a simple one, albeit complicated, by a number of attributes including non-linearity, uncertainty, emergence, scale, self-organisation and feedback loops (Table 1). Acknowledging these means accepting both their implications and lessons for future action (Berkes et al., 2003). A multiplicity of perspectives is needed to analyse and manage complex systems. Recognise that in complex systems there are a number of ways to arrive at the same endpoint. In South Africa, the intentions of the National Water Policy for South Africa (1997) and the Act are captured in the slogan 'some, for all, for ever, together. 'This summarises the intention of redress underscored by two principles that are the foundations of the Act: equity and sustainability. Both the National Water Policy and Water resource Strategy also recognise the important of efficiency in use (detailed in Box 2). These principles are to be given practical meaning through the strategic planning process that comprise the catchment management strategies, and that we now outline. In South Africa, catchment management strategies, which are a legislative requirement, offer the opportunity to plan for complexity and to manage this through a strategic, adaptive process that embraces learning informed by practice (DWAF, 2004 a). We will focus on how this is approached so as to achieve both sustainability and equity, but first the framework that guides the development of catchment management strategies is presented. For this country, a vital component of IWRM is the progressive devolution of responsibility and authority over water resources to catchment management agencies, or CMAs, which will have jurisdiction over water management areas (DWAF, 1998). 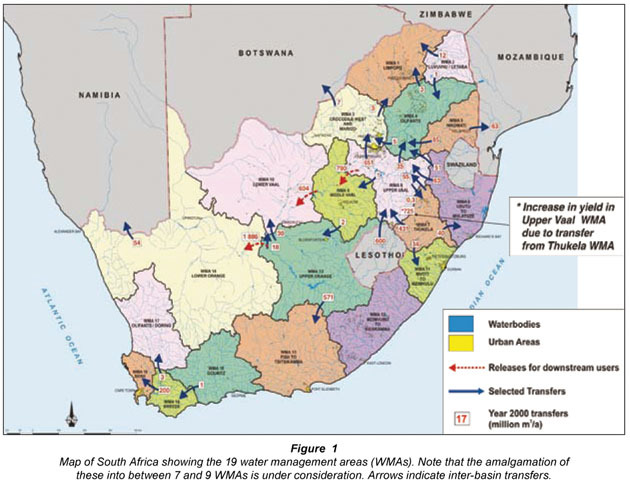 In terms of the NWRS, 19 water management areas have been delineated in South Africa (Fig. 1), although these may be amalgamated. The CMAs are in various stages of establishment. The Act requires that a CMS must be developed for each of the Water Management Areas and states: 'A catchment management strategy is the framework for water resource management in a water management area. The NWRS provides the framework within which all catchment management strategies will be prepared and implemented in a manner that is consistent throughout the country'. One of the first functions of water resource management to the CMA will be the development of a CMS, described in Box 3. Indeed, the NWA states (Section 8): 'A catchment management agency contemplated in Chapter 7 must, by notice in the Gazette, establish a catchment management strategy for the protection, use, development, conservation, management and control of water resources within its water management area.' The following section provides an overview of the framework that sits at the core of these guidelines (DWAF, 2007 a), which also cover issues of policy requirements, roles and responsibilities, sequence and procedure and public participation (see Du Toit and Pollard, 2008). Strategic planning is needed to honour our commitment to change. With the potential to create shifts, strategies have immense power in that they shape how things can - and will - be done. In South Africa this means explicitly addressing the transformation ideals of achieving equity and sustainability. Strategies should set the scene and ask the questions: what does this mean? And,what can be done about it? For example, a particular strategic approach is required to bring about equitable water allocation to ensure that the available water is used to reduce the current gap in equity. The guidelines define a catchment management strategy as a set of medium- to long-term action programmes to support the achievement of sustainability, equity and efficiency through integrated water resource management. They should complement policy and be given effect through detailed plans. The CMS comprises a suite of sub-strategies which provide the basis for business and operational plans. Importantly however, whilst strategies will differ between WMAs so as to reflect their different priorities, there are certain core strategies, or clusters of strategies, that must be included. Secondly, strategy development is a strongly iterative process and they will evolve as CMAs assume more responsibilities and as they learn. Thus not all issues can be developed as part of the first strategy. Thirdly, different components of the CMS will be developed at different scales of space and time; for example, different approaches may be required for different sub-catchments. In order to avoid confusion that this can create these scales, which must be meaningfully and appropriately selected, must be made explicit. In view of the legislative requirements, an overall framework for a CMS was developed (Fig. 2). Integrated water resource management in South Africa is conceptualised as four clusters - Parts A to D - of information and strategies, which collectively comprise the strategy. A number of these deal specifically with the 'business' of IWRM whilst others facilitate the operation of the CMA and the strategies. This does not imply that no further strategies are needed; they represent what have been called the core sub-strategies. Notably, the clusters are not necessarily sequential, although certain priorities exist in respect of some clusters being conducted earlier that others (e.g. Part A; see also Chapter 4 of the Guideline). The vision for the WMA. Indeed, the vision is the cornerstone of the strategy since this provides the overarching strategic intent. Based on an understanding of the current situation and potential future directions, a stakeholder vision is defined. The vision must address the interrelated objectives of sustainability and equity because the subsequent strategies, particularly those described in Part B, give effect to this intention (DWAF, 2004 a, Ch. 3). Once a vision has been set for a WMA, two key, complementary strategic areas, known as Resource Directed Measures (RDM) and Source Directed Controls (SDC), have been identified by the NWRS to achieve the vision. 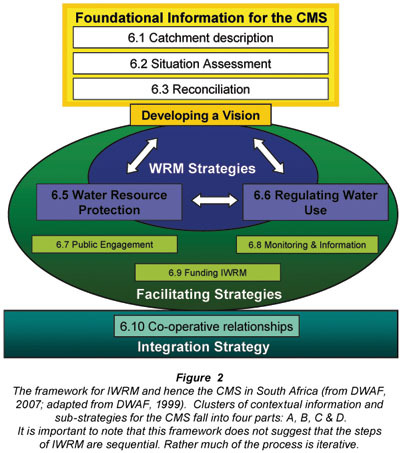 Collectively, these are the key, overarching strategies for IWRM in South Africa (DWAF 2003 b, 2004 b-e, DWAF and DFID 2004, DWAF 2005 a-c, 2006 a,b). The RDM are directed at protecting the water resources base by setting objectives for the desired condition of resources, and collectively this comprises Classification, the Reserve and Resource Quality Objectives. These measures focus on the quality of the water resource itself. Resource quality means the overall condition of the water resource (including quantity and quality) of in-stream and riparian habitats and aquatic biota. The SDC are measures to control water use to limit impacts to acceptable levels, as defined through RDM, These measures contribute to defining the limits and constraints that must be imposed on the use of water resources to achieve the desired level of protection. 'Water use' refers to all 11 uses defined in the Act. The SDC cannot be undertaken without RDM and vice versa. These strategies apply to both surface water and ground water resources, and to issues of quantity and quality. The facilitating strategies are not directly linked to IWRM. Rather they are the 'oil' that keeps the 'engine' of IWRM going. In other words, without strategic plans for stakeholder engagement and communication (DWAF, undated; DWAF and RSA, 2003, and see Du Toit and Pollard, 2008)), information management and monitoring, and finances (DWAF, 2006 c; b), the intentions of IWRM cannot be achieved. As is well recognised by now, IWRM requires collaboration (see for example GWP 2002; Motteux, 2003; Burt, 2005). The inter-linkages described above signify that multiple institutions are involved with various aspects of water-related activities, either directly or indirectly (see for example DWAF, 2003 a; c; d). Other strategic planning processes either have to be aligned (e.g. relevant municipal planning processes such as the integrated development plans and water services development plans; the sectoral plans such as water conservation & demand management plans) or at least considered. The latter may include the public sector planning such as the provincial growth and development strategies, which may cut across water management areas, as well as ASGI-SA and private sector plans (e.g. mining and development). Moreover, given our international agreements, such as those governing the Limpopo, Inkomati and Orange River systems for example, the imperative for collaboration extends beyond our national borders. Therefore the CMA must set out strategic plans for ensuring integration and this strategy is effectively the 'glue' that holds IWRM together. At the time of writing the development of certain key policy instruments was still underway. These include, amongst others, the classification system (DWAF, 2006 b), the Water Allocation Reform Process (DWAF, 2004 e; 2005 c) and the National Water Resource Information Management Service (DWAF et al., 2004). As mentioned, the cornerstones of the Act that set the strategic direction for IWRM in South Africa are equity and sustainability. A 3rd principle that is often quoted  that of efficiency  is raised in both the White Paper and the NWRS. This is an important precept and objective for water resource management in that it is one of the instruments for achieving equity and sustainability. This is explicitly recognised in the call for each sector to develop water conservation and water demand plans (see DWAF, 2004 a; c; d). Nonetheless, as a concept it requires careful thought and definition since interpretations can vary between water-use efficiency and economic efficiency (the latter is mentioned in the WSA and both are referred to in the NWRS). With CMAs and other water service institutions being required to recover costs, the objective of economic efficiency may undermine the intentions of sustainability and equity. In keeping with the intentions of the NWA, the following discussion focuses on the first of these two principles. The strategic path to achieving equity and sustainability lies not in one sub-strategy alone but in the expression of these as cross-cutting themes throughout a catchment management strategy. This is consistent with managing in complex systems as described above where outcomes reflect the consequences of multiple factors and moreover, because they are not entirely predictable, we need to adapt as we learn. The catchment management strategies  if collaboratively, judiciously and thoughtfully developed, are examples of planning and managing in complex environments. Both of these principles rely on the whole  the collective effort of all the aforementioned sub-strategies - rather than simply on a single strategy. For example, it is easy but naïve to assume that equity will be achieved through compulsory licensing or water allocation reform alone. Similarly, sustainability cannot be achieved simply through the development of a Reserve determination or the determination of a class, but must be addressed through the synergies of various sub-strategies. An example of this is given in Fig. 3. Central to the development of a CMS is the vision, which is required to address both principles through the creation of a desired long-term view for the water resources that captures the idea of sustainable development and equity (DWAF, 2004 a). Thus whilst sustainability is colloquially - and sometimes somewhat crudely - interpreted as 'water resource protection', and technically may be centrally 'held' within the RDM sub-strategy, it is a principle that underscores our approach to IWRM. Hence the assessment of the current and future situation must take into consideration the 'status' of sustainability of the catchment in question, by asking - 'is this a sustainable situation?' - and then to plan accordingly. The assessment clearly calls for a holistic approach, using sustainability criteria (amongst others; see for example those developed by Pollard et al., 1998; also in DWAF, 2007 a). These criteria should be fed into the monitoring strategy as resource quality objectives. For example, if the Reserve is regarded as a benchmark for sustainability, then this can serve as a criterion for assessing the current condition of the river as well as for future monitoring. Once the desired future state of water resource protection has been described (in the vision) and set (for example through classification and a Reserve), it is essential to remember that there are a range of other strategies and plans required to give effect to this (see Fig. 3). Importantly, water use must be regulated to achieve this vision of protection so that sustainability can be ensured. This is given depth and meaning through the sub-strategy on source directed controls including for instance, the water allocation plan and the conditions of a water use licence. Equally, various sub-strategies and tools exist to collectively address the commitment to redress and equity. Again, whilst these are centrally 'held' by the SDC sub-strategies for water-use authorisation and licensing, this principle runs through the entire strategy. These tools, some of which are still being developed, include Schedule 1, 'General Authorisations and Compulsory Licensing', which are included in the Act, as well as the Water Allocation Reform Programme. Other mechanisms include financial incentives/subsidies for emerging farmers and support for augmentation options (e.g. rainwater collection). The basis for equity is provided by the situation assessment and visioning. The former requires an assessment based on criteria pertaining to equity; the latter requires a vision that talks to equity, redress and transformation (DWAF, 2004 a). Additionally, the ideal of securing water for basic human needs is provided for by the Basic Human Needs Reserve that is part of resource directed measures. While the principle of equity aims to adjust the imbalances and inequities of decades of skewed water access it is unlikely to adequately emphasise the need to provide water for the most vulnerable groups in society. The CMA has a central role to play, essentially through the CMS, to ensure that special attention is given to water for vulnerable and poor members of society (see Schreiner & Van Koppen, 2002). Multiple stakeholder platforms and plans for engaging the public are also important means for addressing both equity and sustainability through democratic decision-making processes. Equally, monitoring, finances and co-operation are all essential components for achievement of these goals. It is also imperative to stress that these strategies are not developed in a vacuum. Failure to recognise this has led to some surprises and unintended consequences (see for example Pollard et al., 1998). In a strategic planning environment there are planning processes that both contribute to the success of the CMS, and/or are potentially affected by the CMS. These will have to be aligned or at least considered (see Part D, above). These are not linear, but are linked and they have serious economic, political and social mandates which will have to be accounted for in some way. We suggest that the NWA and related policy documents provide an enabling environment for planning and managing water resources in complex environments. The catchment management strategies  if collaboratively, judiciously and thoughtfully developed - are demonstrations of how key strategic plans can be designed to achieve equity and sustainability within such an environment. Essentially the above discussion demonstrates that the strategies are designed to manage in complex environments by acknowledging that multiple drivers, multiple outcomes and feedback loops are all realities (see Table 1). Moreover, because outcomes are unpredictable and lags are to be expected, the process is iterative based on learning and reflection. In this regard each strategy must be reviewed every five years so as to build on new information, experience and learning. The development of catchment management strategies is driven by principles (not content alone) and we suggest that these, namely equity and sustainability, help one to 'keep an eye on the ball' and to navigate difficult issues that emerge in complex systems in a flexible way. The importance of visioning and the development of options through scenarios offer important management tools that are well-recognised in complexity theory for accommodating change, as well as establishing a hierarchy of actions that can address the overarching principles. In complex systems, the users must be part of deriving management solutions since this is where and how they learn. If they are excluded, the 'system' does not learn and hence adapt to change and surprise. This is important given that different configurations of management and use can still achieve the overall vision of equity and sustainability (i.e. in complex systems different paths can lead to the same end point). Self-organisation and identity of stakeholders are all essential considerations for building a collective understanding and hence resilience in a system. Thus for example, in developing water conservation strategies, the agricultural sector not only develops a sense of ownership and identity but also contributes to achieving the vision through their own internal regulation. 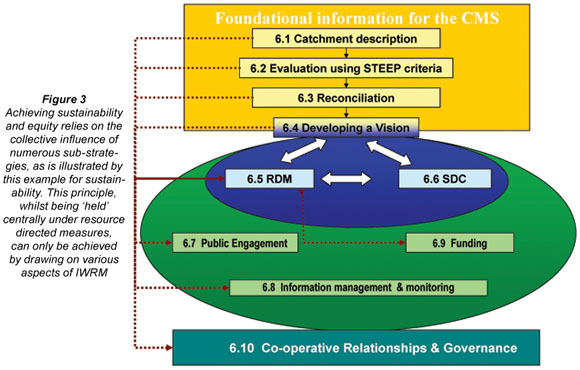 Finally the recognition of embeddedness (that actions do not exist within a vacuum) and the need to collaborate with other plans and processes  articulated through the need for co-operative governance and participation  are important aspects of building resilience within catchment systems. We gratefully acknowledge the efforts of both Mr. Johnny Beumer and Bill Rowlston (both formerly of the Department of Water Affairs & Forestry, now with Ninham-Shands and Coastal & Environmental Services, respectively). Without their continuous support and commitment to overseeing the writing of the Guidelines for Catchment Management Strategies this work would not have been possible. Dr Harry Biggs (SanParks) has made invaluable contributions to discussions on management in complex systems. Our co-authors of the Guidelines, Mr Y Reddy and Mr T Tlou are also acknowledged. We thank two anonymous reviewers for their comments. # Revised version. Originally presented at the International Conference on Integrated Water Resource Management (IWRM) entitled: Lessons from Implementation in Developing Countries which took place from 10 to 12 March 2008 in Cape Town, South Africa, at the Cape Town International Convention Centre.